So I must confess that sometime I am a sorry example of "calm under pressure". Today I was in a huge hurry and running around the city trying to get things done so I could get home and help as we have a short term team from the United States. As I left the store I loaded the car and headed to the other side of town to buy some charcoal for our BBQ. When I arrived on the other side of town I realized that my wallet was missing. I immediately realized that I had left it in the shopping cart. As you can imagine my heart sank. Here in Mozambique if you do such a stupid thing, you can know for sure 100% of the time that you will never see it again. To make matters worse my wallet was full of cash for the team, drivers license and credit cards etc... I was sick to my stomach and horribly distraught as I called Lynne. I told her what happened and asked her to pray as I was headed back toward the store about 20 minutes away. She and Andrew began to pray and ask God for a miracle in light of the realities of where we live. I no sooner hung up with her and my phone rang. I didn't recognize the number but answered it anyway. A voice on the other end said in English, "Are you Rodger Schmidt?' Yes, "I said" with a bit of hesitation. He went on to tell me that he had found my wallet in the parking lot and would wait until I got there to return it to me. I hung up the phone, my heart still pounding, stomach churning and I am oh so amazed at our Gods amazing, unquestionable grace. In my rushing, stupidity and forgetfulness, God saw fit to demonstrate his goodness and power in the midst of certain loss. I have been praying ever since that God would use this experience in my life to make me a better version of myself and out of his clear provision and goodness long to follow him closer, trust him more faithfully and seek to demonstrate that kind of Grace to the people I come in contact to every day. I'm still shaking in my boots and a bit queasy but oh so amazed at a God who loves me enough to show me the best and worst of what this world has to offer. To the German born tourist I will never be able to pronounce your name and most likely will never see you again, God bless you and I hope you enjoyed your special dinner out with your children on us. My prayer for you this day that you too will see God's amazing and unquestionable grace in your life. Our boy’s education: A child in high school and even our home school materials have increased our need. We need to raise an additional $300 a month for this area. Housing: the cost of renting and maintaining a house here is growing at a very inflated rate. Last year, we moved out of our house in Maputo because the landlord chose to double our rent. Still, we need to raise additional funds in the amount of $300 per month. Work Funds: Due the drop in the value of the dollar and SA Rand, political influences in South Africa and Zimbabwe, we are experiencing inflated prices in Fuel (over 6.00 a gallon) and in many areas of cost of living we are experiencing up to an 85% increase. Do to these reasons, we are in need of raising an additional 300.00 a month in our work funds. These funds keep us on the road, enable us to be good stewards of mission property, and do the business that keeps us legal and free to do the work we came to do. Total monthly need: 900.00 a month! In all these things, we want to express our thanks to each of you for your continued support these past 5 years. If you are unable to raise your support for us, we still thank you with overflowing hearts for your current prayer and financial support. Please continue to partner with us in the great work God is doing in Mozambique. Sometimes we can only say "WOW!!!! ", followed by "Thank you, God. You are so amazing!!!! The events of the last 24 hours have us astounded. Where do we begin? HMMM!! Well, let's begin by saying that we are trying to learn and trying to teach our interns to look for what God is already doing around you and join Him in that work. We are trying to learn and trying to teach our interns to live like Jesus did. He joined the world and met people right where they were. Saturday was about the 5th week for our guys to play soccer in the village where MozOvos is located. Each week after the game, one of our interns has given a testimony of how they came to faith. This week, one of the young men said during this testimony time, "I have a question. I want to know how do you know God exists and if he does, what does he want from me?" Stunned silence at first, but then a great discussion ensued and then an offer for him to ask more questions, come to church to learn more, and begin the journey. Today, six guys from this village came to the church service at our house! Our interns are starting to see the fruit of their labors to build relationship and, through their lives, draw people to Christ. There is a huge need in this village. Our team of 12(soon to be 14 with the arrival of Ken and Arlene Flurry) will start to divide each week. Half of us to have church here in our neighborhood and half to this village, 18 kilmeters away to begin a work there. Amazed yet? There's more! I'll start by saying, it's been a man's world at my house for these past few months. I am the only female living here and when the interns bring their friends to our house for basketball, they are all guys too! I've been praying for girls to start attending English class and church. I've been thinking about ways to draw girls and women: cooking classes, sewing, arts and crafts? In the last few weeks, the staff of YFC have been hosting dance classes for youth from the local high school in the covered area in our yard. These are kids they are developing relationships with, the purpose being to reach them for Christ. About 30 teenagers, mostly girls! Rodger began talking to their leader about the importance of connecting these kids to a church in the community. A place where people can love them and continue to hold Jesus out to them. Today, 5 of them came to church! We can't tell you how excited we all are! God is doing more than we ever dreamed possible! Please continue your prayers for us, the Schmidt's. Also for Aderito, Americo, Artur,Daudi, Luis, Macuacua, Rafael, and Reginaldo. Also for Ken and Arlene Flurry as they arrive this week to help us. For the people of 25 de Junho and Agostinho Neto. We have known Sr. Bule for almost five years. Over the years he has proven to be a mature believer, leader in his church and Godly husband and father. He is now the administrator of our business MozOvos. He has been a huge encouragement and a joy to work with. Earlier today we had a break for all the work that we have been doing getting MozOvos up and running. I simply asked him what has he learned over the past few months being the project manager and overseeing the work. He went on to remind me of what his life was like just a year ago. He reminded me that he was within days of leaving his family to try and find work in South Africa. This is a common practice for Mozambican men as Mozambique has a 98% unemployment rate. He is a carpenter by trade but only worked when some foreigner needed something built or repaired. This type of work does not provide for a family of seven. When we began working with Sr. Bule, we hired him as an administrative assistant to help with the administration tasks of our mission. I remember telling him that it would only be a few hours a week and a minimal salary. This was enough to keep him in Mozambique and present to lead his family. Well, since that first day his responsibilities have grown to overseeing and leading the whole construction project of MozOvos. He is also responsible for the leadership of 12 employees and to build relationships with the community leaders of the village of Agostinho Neto. He confessed today that a year ago he would have never believed that he could do such a thing and actually be successful. He is absolutely blown away by the fact that MozOvos has actually become a reality and his life and family has been completely transformed. He is hopeful for the future and has begun to dream about the future for the first time in his life. He has caught the vision of the Internship model of ministry, continues to blow me away with his joy and commitment to learn, grow and to be being stretched in his leadership abilities and his faith. Sr. Bule is an amazing man and offers a glimpse of the kind of person the International Internship in Mission hopes to produce. 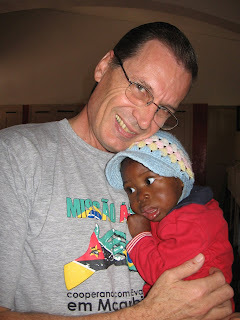 If more leaders like Sr. Bule were leading the church of Mozambique, no telling what God could do. Honestly, I believe Mozambique will have many more leaders like Sr. Bule and I can’t wait to see what God IS going to do. It has already begun! Pray for Bule, our 8 Interns, the Schmidt’s and the next generation of missional leaders in Africa, Mozambique, the United States and the World. one-year internship in mission in Mozambique. One of our precious ones went to be with Jesus. Some of you who have visited us here in Mozambique will remember him. He's one of the kids I could have taken home from the orphanage in a heartbeat. Pretty much everyone who met him felt that way about him. Sweet and snuggly Carlos. Carlos was probably 3 or 4 years old but couldn't walk yet. He wasn't toilet trained and couldn't feed himself. I'm not sure of the physical problems. Possibly cerebral palsy. I'm thanking God he's with Jesus but really sad that he won't be there for me to hold anymore. What Does Water have to do with LEADERSHIP? One of the ongoing challenges of living in Africa is the sometimes lack of water. At our house we have three huge reserve tanks to ensure that we always have the water we need. However, recently there hasn't been enough water coming into the property to fill the tanks. This has resulted in a massive water shortage. As you can imagine, with the 4 Schmidts and 8 interns, the need for water can become desperate. This last Sunday, we had so little water, I was not able to shower and couldn't shower all day. I'm sure I offended many during the day with my lack of cleanliness. Earlier that day, I reminded our interns to conserve water and proceeded to question them as to their current water conservation practices. After a brief conversation, I came to learn that not only were they not keeping to our five minute shower rule, but they were taking two to three showers a day. One intern even confessed that normally this would not be the case. But since we have HOT water, they have been enjoying and lavishing themselves with the pleasures of all the water available, depriving the Schmidts of precious water to bathe even once a day, flush toilets, do dishes, wash clothes, as our part of the house had become completely void of even one single drop. As you can imagine my initial response was to scold, discipline, and rip out the hot water tanks. however, and thankfully, the Lord gave me a different idea. I sat down with all the guys and began questioning them about the leadership and relationship norms here in Mozambique. They clearly and honestly stated that their African leaders are typically autocratic, somewhat dictatorial and someone to be feared. Typically people follow out of fear. If not obeyed an individual could lose their job, relationship, place to live, other resources, reputation or worse. Honestly, followers obey because they don't have a choice, not because they desire to do so. The type of leadership we have tried to model with our interns is that of "coming along side", not to force people to follow, but to model, influence, mentor and lead through relationship. As we were talking about this, I began to share with the guys the dangers of leading this way. The biggest danger is that the "followers" are not obligated to follow, listen or offer respect. They are FREE TO TAKE ADVANTAGE OF THE LEADER. This is a huge risk. The upside to this type of leadership style is that it liberates the followers to choose. They can freely choose to not take advantage, but to offer sincere respect, deepen the relationship and respond not out of obligation or fear but out of a genuine will to do so. I made the connection with the interns by using our current water shortage situation. I confessed to them that I had felt taken advantage of and used. I also shared with them that It would be very easy for me to write a huge list of rules, post them on the wall and stand at the bathroom door dragging guys kicking and screaming out of the shower if they exceeded their time limit and/or took more than one shower a day. I could even rip out the hot water tank to insure that no one had hot water and my leadership would be followed to the letter of the law. I am more than capable of doing this. I am a big guy! They guys lovingly call me Gorilla man. However, I told them that I wouldn't do that. I wanted them to be free to choose what kind of FOLLOWER they would be. I wanted them to see that they did not need to respond out of fear of punishment or loss of relationship. They needed to know that it was possible to respond out of a sincere desire to show respect and love, not only toward me as a leader and my family, but for our life together in community. I also challenged them to choose what kind of LEADER they wanted to be. The decisions they make today regarding their water usage, will demonstrate what they believe about leadership and relationship. It will also determine what kind of leader they will be today and in the future. This was an amazing experience. I am so thankful for the opportunity to live with these guys. They have been an invaluable addition to our family, life and ministry. I must confess, I came Africa five years ago with the intention of having lasting impact and influence on the people of Mozambique. I am increasingly being convinced that God sent me to Mozambique so the African people could teach and influence me.